Tanzanite, druzy, and a gold horseshoe create a sparkling force field of serendipity. Some say luck has nothing to do with it. We say, why take your chances? 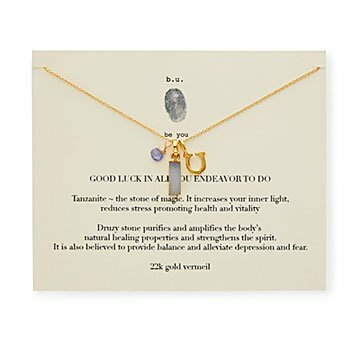 Mary Steratore's delightful charm necklace has you covered: delicate tanzanite ("the stone of magic") is paired with sparkling druzy (said to strengthen the spirit) and a 22-karat gold vermeil horseshoe to create a sparkling force field of serendipity. Handmade in Pennsylvania. When necessary, use warm water and soft cloth. gift for my niece going away to college, she needs inspiration! The first product I received had a lot of the gold coloring on the top side of the druzy stone. I requested a replacement and customer service was very responsive and easy to work with. They started the shiping process right away and made sure I got the new product on time. There is still some gold coloring on the stone but it is less than the first product. Be aware that the necklaces don't look exactly like the picture it is more of a handmade look - it looks like the druzy stone was hand dipped in gold which works for me because it looks more unique than off a machine. Great present for the graduate! A unique gift for the college graduate.